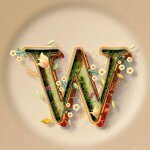 I think that during the open process, the character before the hyphen gets transformed into some combination with the previous character. The hyphen is transformed in "tiret conditionnel" (conditional hyphen). Perhaps because when opening a PDF, there's no possibility to distinguish them from hyphen. Since we use a lot of them in French, it would be better to have only regular hyphens, and delete manually the one added by hyphenation. It appears that the APub PDF import does not recognize the soft-hyphen there. Not sure why the author would use a soft-hyphen there, but that was the Unicode ID I got. I edited the PDF and copied the characters and pasted them into a Unicode identifier tool. I edited the original PDF and replaced that character with a regular hyphen and then it imported fine. This does not seem to be an APub error. The soft-hyphen should only appear if it is needed at the end of a line. So I do not know how it ended up being the required dash/hyphen between those words in that PDF. You posted while I was testing. How does a soft-hyphen or conditional hyphen end up in the middle of a sentence in French? They don't unless we need them and manually insert some to add a hyphenation that doesn't follow the rule set in the paragraph style! (usually for aesthetic). It's a reason to have them in a text, if the text flow differently, they'll disappear. Some can be imported from Word too, and they can appear/be visible in ID (why not in APub? ), and we need to delete them (I didn't checked their unicode value, I thought they were converted to regular hyphens, while exporting as PDF or copying-pasting). Another strange point in this PDF is that's there aren't regular spaces too. Yes, that is how I would expect soft-hyphens to be used. So it is the same as I am familiar with in English. But it is weird that a soft-hyphen appears in this compound word. I would expect to see a non-breaking hyphen, or a regular hyphen, but not a soft-hyphen. The PDF document info says it was created with Scribus 1.5.4. How can a soft-hyphen appear in the middle of a sentence? Same effect with a PDF created with Scribus 1.5.3! Soft-hyphen and non-breaking spaces instead of hyphens and spaces. Well that is really odd. Apparently this has been an issue with Scribus for awhile. I found an unanswered post in the Scribus forum from Nov. 2017. As far as I am concerned, I just use the hyphen that shows on my keyboard. No Alt+ combination or whatever "clever". I can only conclude that there is a "glitch" somewhere with Affinity tools. Note 2: I am using common fonts like Arial, Times New Roman, Helvetica and Verdana. Nothing fancy. The problem is not an Affinity "glitch." The problem in Scribus is producing PDFs with incorrect characters. Any application importing these broken PDFs is going to properly import these wrong characters as written. The PDFs will print properly, but that does not mean they are structurally correct. There is no rational reason that I am aware of to justify replacing all spaces with non-breaking spaces. But I have another example of conversion issues with the Word -> PDF -> Publisher process. 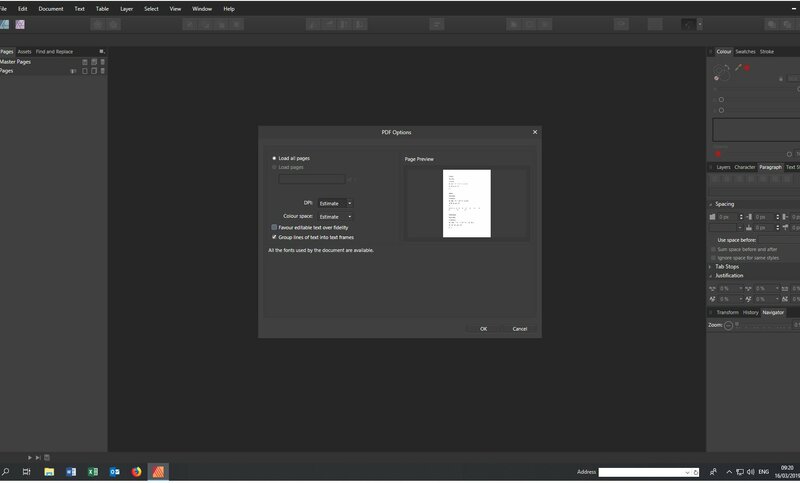 2) Save Word as PDF (with option rasterize if not embedded) or PDF/A Results in Affinity look the same. Both tested. 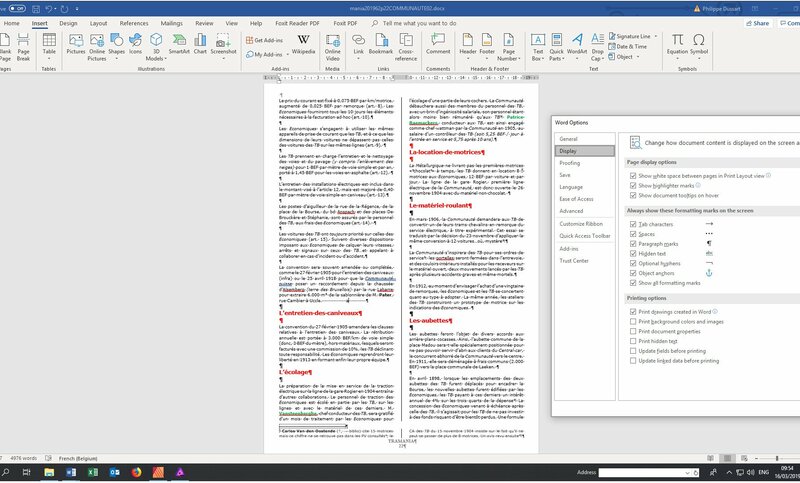 3) Open PDF in Publisher 247 with option "Group Lines in text frame"
- the result is "strange" Publisher creates Text Frames that do not seem consistant with Word control characters. An additional logic seem to take place. In this case, I think that a new frame should not be created by Publisher after a certain amount of spaces, but after a paragraph end. 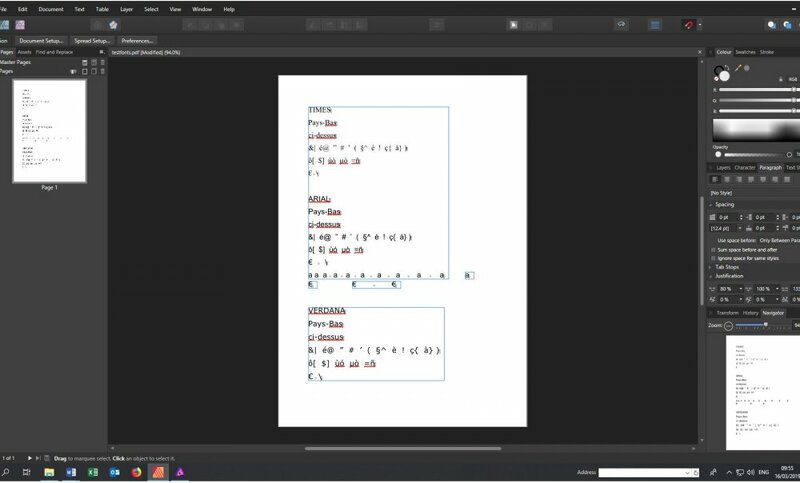 I would also suggest to add a third option when opening PDF files : "Convert blocks of text" in a "structured" set of frames. This would be an useful option for publishing simple documents as books or magazines containing "structured" pages of text. 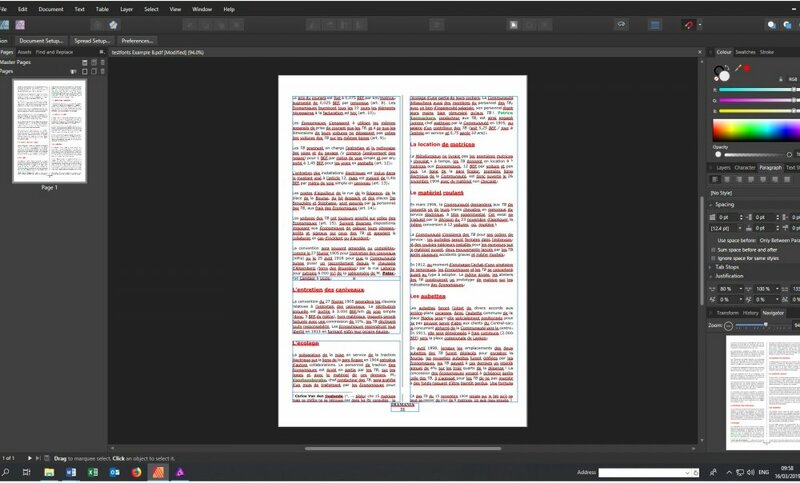 Alternatively, a third option would be "For each page, put all text in a single Text Frame, while respecting the original visual position as per PDF display by Acrobat Reader. - CTRL+ right click on frames to select, then merge. 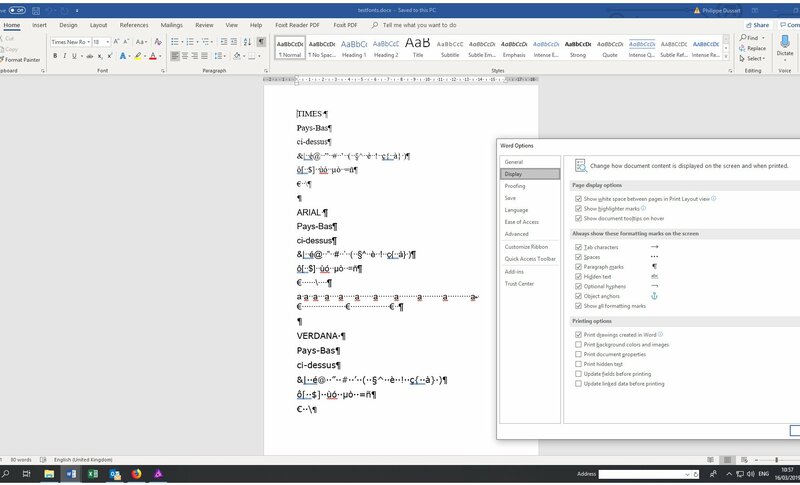 - Option 1: Keep the the X Y positions of the text as per PDF display by Acrobat Reader. - Option 2: Wrap text in the merged frame.